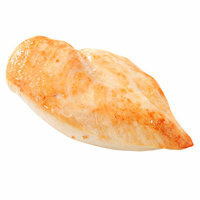 We can’t get enough protein... especially lean sources that give us the most bang for our calorie buck! Last week, we shared four favorites, as featured on “The Protein-Packed Episode” of our podcast. This week, we’ve got the rest of the list, plus a bonus protein source and a dozen protein-packed recipes! This meatless protein makes the list! 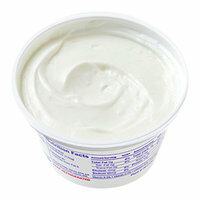 The pure, plain variety has only naturally occurring sugars and packs a probiotic punch. Use it as the base for your breakfast bowl (add no-calorie sweetener and vanilla extract to offset the tartness), or think outside the box… er, tub! 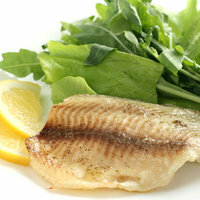 Tilapia is one of the most cost-effective fish in the sea, and its mild flavor means it goes well with just about everything. The filets are generally thin, so they cook up fast! Similar picks that are low in calories and big on protein? Cod and sea bass... Mmmm! An ounce might not sound like a large portion, but that’s the size before the protein powder is prepared. Mix an ounce with water and ice, and you're in BUSINESS. Add it to recipes to REALLY unlock the magic. Our brand picks? 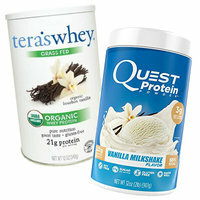 Tera’s Whey and Quest Nutrition. HG FYI: As an Amazon Associate, we may receive compensation from some of these links. Today, September 21st, is World Gratitude Day. We’re truly grateful for each and every one of YOU, the Hungry Girl fans... and for low-calorie brownies. Pass along these must-have recipes! Click "Send to a Friend" now.